Our portable pond suction dredge is effective at removing sand, silt, and muck that ruins the waterfront and prevents you from enjoying the beach. This dredge system has a powerful 190cc Briggs & Stratton Professional Series 4-stroke gas powered engine. The capability of this powerful sediment pumping system allows it to pump about 2118 cubic feet of water per hour, (15,800 gallons) along with 211 cubic feet of sediment per hour. *Volumes may vary based on the nature of your application. The unique design of the portable dredge allows you to hover the pump over the bottom of the lake to efficiently remove muck, silt and lake bottom sentiment. The centrifugal pump is also equipped with a mill that effectively grinds down the roots of reeds and other seaweeds. This portable lake suction dredge is designed to provide homeowners, contractors and shoreline management services the ability to dredge and transfer unwanted aquatic debris and sediment out of lakes and ponds. Additionally, the portability of this dredge makes it a money saving alternative to hiring an excavator who has limited reach, can be destructive to the shore and typically deposits the material adjacent to the shore only to have it wash right back in after the first good rain. – The sludge can be pumped up to 492' away depending on lift height and sediment concentration. – Proven design has been used for many years. 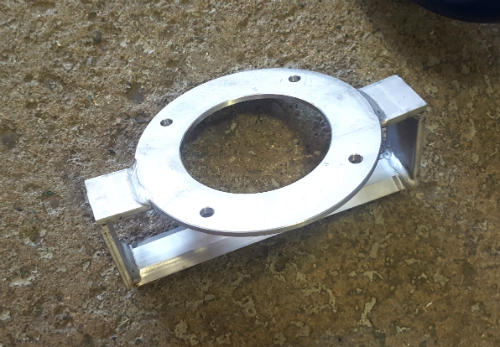 Bottom Softening Knife Attachment for loosening firm packed bottoms - This attachment will also help protect the dredge blades from large rocks. 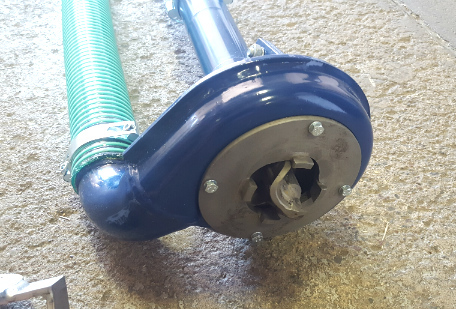 The dredge is delivered with a variable mounting, 10-foot transparent hose stub for connecting to your discharge hole and one Cam Lock coupling. You can mount it on a raft, a steady boat or you could do some dredging from the ice. It's best to mount it on a platform that you can remove from the raft when you want to use the raft for something else. Many people also buy an extra quick coupling so you can easily divide the hose into the appropriate lengths.. The maximum hose length we recommend is 450 Ft, maximum lift height is 78 Ft. Stones and rocks as large as an inch can pass through the pump and anything larger is blocked.